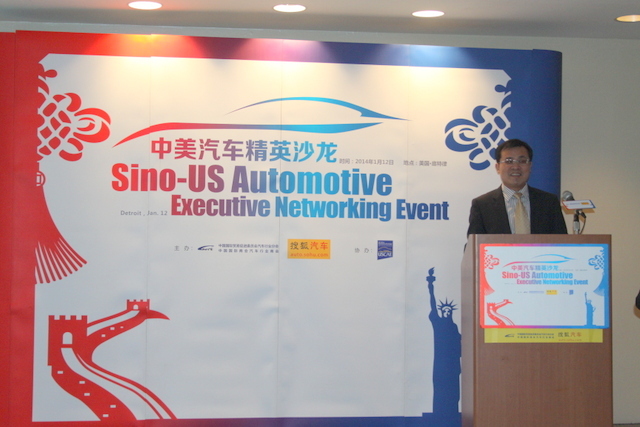 On January 12, Chinese Consul General to Chicago Zhao Weiping attended the Sino-US Automotive Executive Networking Event in Novi, Michigan, which was co-hosted by Automotive Sub-Council of China Council for the Promotion of International Trade (CCPIT), US-China Automotive Exchange (USCAE) and Sohu Auto. More than 70 guests attended the event, including Chief Operating Officer of Michigan Economic Development Corporation Steven Hilfinger, Wayne County Executive Bob Ficano, Chairman of USCAE Wang Dazong, Secretary General of Automotive Sub-Council of CCPIT James Chai, among others. Consul General Zhao said in his remarks that the year of 2013 was another thriving year for auto companies both here in America and in China. The Big Three, Ford, General Motors, and Chrysler, all performed very well. Their joint ventures in China continued to develop in a robust way, and General Motors sold more than 3 million vehicles in China last year. Meanwhile, China has been the world's largest auto producer and consumer for five consecutive years. Nearly 100 Chinese auto companies have established their businesses in Metro Detroit, and there is still growing interest among Chinese enterprises in investing here. He believes that the auto industries of the two countries will find more opportunities of cooperation in the coming years.